Hey everyone! Long time, no blog- it's Sara here. Things here in Chile have been quite exciting lately. During the third week of February, I had a visit from a fellow bookclubber and her friend. Rachel and Gina were wonderful guests who were up for anything! Matt and I definitely filled their time here in Chile to the max. As soon as the girls arrived, the three of us jumped on a bus to Valparaiso. There, we explored the hills, ate delicious seafood, checked out the local bar scene (completely dead at 10:30- we were too early), rode the funiculars, took in the many boats and walked up and down many, many steps. The following day we checked out of our hostel and took a bus over to Valpo's sister city, Vina (with a ~) del Mar. There we hung out on the beach and dipped our feet into the Pacific. We also all burnt ourselves. Who knew one hour on the beach could do so much damage? Lesson learned! Upon our return to Santiago (which included an hour-long conversation with my bus mate in SPANISH! 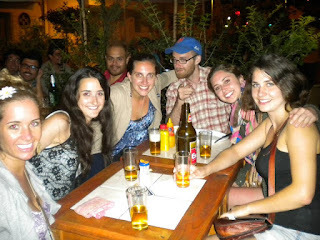 ), the four of us went out to a couple of bar/restaurants (in Chile, they are called resto-bars) in our neighborhood. We first went to "The Clinic," which is a famous bar/restaurant here in Santiago that leans left politically. 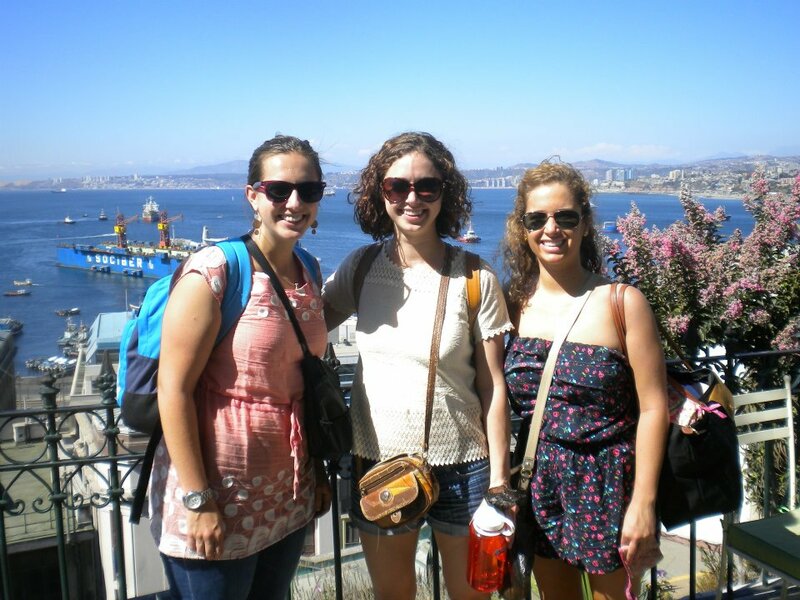 There we ran into two travelers us girls met at our hostel in Valpo. They were wonderful company for the night. We proceeded to return to our apartment and dance to most of Girl Talk's "All Day." As it was Monday, our neighbors weren't too impressed. But, as I always say, "How can you not love Girl Talk?" We managed to wake up at a reasonable time on Tuesday for our tour of La Chascona, Pablo Neruda's house- one of his three Chilean houses and the only in Santiago. We learned a ton about Neruda and his many "lady friends." At this point, Matt had to run to work, so Rachel, Gina and I walked around the Bellavista neighborhood and through Parque Forestal with a stop at Emporio La Rosa. Rachel and Gina especially enjoyed the Dulce de Leche helado. That night it was off to Argentina for Rachel and Gina and back to "the real world" for me. Rachel and Gina returned from Argentina on Friday afternoon. After hanging by our rooftop pool (yeah, you just read that), we headed over to La Piojera for some terremotos and pure Chilean people-watching. You can always count on the characters coming out at La Piojera. We then ventured to the Bellavista neighborhood for some Escudos at the many outside tables that litter the sidewalk of Pio Nono. Rachel and Gina were very popular among the Chilean men, even having to refuse free meat and beer. After a quick stop over at our friend Canuto's apartment, we made our way home. Obviously my favorite part of the tour- happy puppy! After we returned to Santiago, Rachel and Gina had to pack up and ship out- back to the good ol' U S of A. 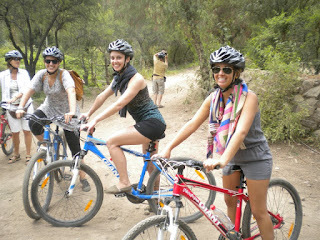 And, of course, Matt and I went back to the routine- giving bike tours and teaching English classes. Thankfully, that only lasted one more week for me- I finished my private tutoring/English classes last week. I will miss the students and the work was not so bad, but the commuting was terrible. I start at Santiago College TOMORROW for meetings and classroom set-up. The students and their families will come for a tour of the new campus on the 14th and classes will start on the 19th. I can't wait to see the new space, meet my students and get back to teaching (little kids that is). Matt continues to give excellent bike tours. In fact, he is mentioned (with a photo!) on Tripadvisor. He has also taken up a few more tutoring classes, which helps out the wallet. On a rare day off together, Matt and I were able to take our bikes out to see some sights around Santiago. We first went to the Pedro de Valdivia Sculpture Park, where we enjoyed some interesting pieces of art and a practicing trombone player setting the mood. We then moved onto the Museo Nacional Bellas Artes to catch the Matta exhibit there. But, we missed it by just two days. Major bummer. Fortunately (at least for me), the day was rescued by spying some new puppies in the park! Matt was nice enough to endure about 30 minutes of my "ooohs," "awwwwws," and "hey buddddies." I plan to visit those little guys again this weekend and maybe stash one in my bag when Matt isn't looking! I continue learning and practicing my espanol with my bi-weekly classes with my wonderfully patient teacher, Romina! As she says, I'm coming along "poco a poco." Looking forward, we have a few visitors coming in the next month. Chilean Will will be home this upcoming Sunday. It should be a fun time chilling with him in Chile (get it- chillin' in Chile? Matt loves my jokes). In addition, Matt's good buddy from home, Davin and his girlfriend, Molly, are coming to Santiago at the end of the month. We both can't wait to show off our new city to them. As always, Matt and I both think of everyone in the States quite often. We miss you all and would love to hear from you. Shoot us an e-mail or comment on the blog to let us know what you have been up to! I really, really love puppies. thanks for the update. misses and kisses(esp to matt). There's nothing Matt likes less than being the token guy in a group of pretty ladies. Watch Out! Ms. B's back in town!